Those sweet potato cookies look amazing! My those cookies are so inviting Priya! 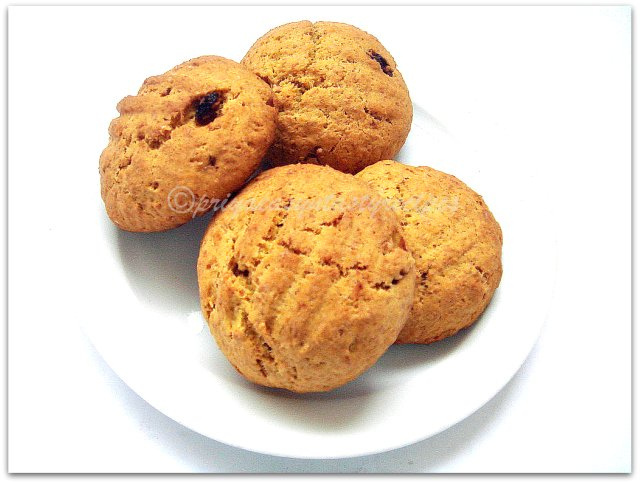 What a great idea:-) Sweet potato and raisin..lovely combo and yummy looking cookies! Like it . Great way to use up the sweet potato. Very innovative Priya & such yummy cookies!!!! Before I wonder about one of your innovative post and get over it another innovative one comes, you are too quick and very innovative Priya. Kudos to you. great recipe n sounds interesting...love all your innovative bakings...cookies looks fantastic Priya.. If you are interested plz link it to my event..
Great recipe Priya, love addition of sweet potatoes. my family lovesssss sweet potato- must try this eggless one Priya ! Eggless cookies look great and love the use of sweet potato. Too good. You can buy the cookbook by pankaj in amazon.uk and i'm still waiting for your bakes in my event :), you simply have to post links in in the linky. A very interesting and unusual combo. Sweet potato is great ingredient, they look pretty plumpy ! Just now I was telling my husband how innovative cook you are Priya. :) And what do I see? Sweet potato biscuits. They look very crunchy. Mashed sweet potatoes in a cookie is new to me. They look delish Priya, thanks for sending them to my event! Got-to try this for sure!Looks delicious! just tried these and they came out so yummy...a nice, healthy cookie!